"This salad is absolutely delicious! I often bring it to our family dinners, and the recipe is frequently requested!" In a blender or food processor, mix avocado, lemon juice, mayonnaise, hot pepper sauce, olive oil, garlic, and salt. Process until smooth. 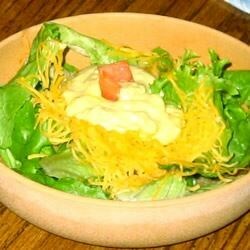 In a large bowl, toss together romaine lettuce, Cheddar cheese, tomatoes, green onions, green olives, and corn chips. Toss with the avocado dressing mixture just before serving. We loved this-the dressing really makes this salad special! I added some fresh cilantro to this. The flavor of the cilantro made this salad even better! Love this salad! I thinned the dressing a bit with whole milk to get it to the right consistency for me. Other than that, I wouldn't change a thing. Yum! I substituted black olives and fresh parmesean over red and green leaf lettuce and it was great! My family agrees Chili-Lime Fritos are the best corn chip to use.